Centers on the clandestine effort by Polish Jews to document what went on inside the Warsaw Ghetto after the Nazis sealed 450,000 Jews in an area of 1.3 square miles. 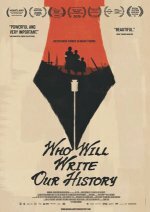 Who Will Write Our History release date was Friday, January 18, 2019. This was a New York release. Friday, February 1, 2019. This was a Los Angeles release.